"The Rise of the Evolution Fraud"
The 1986 Oxford Union debate about evolution vs. creation that was so damaging to evolution that it was expunged from their records! The furious debates between evolutionists and mathematicians that had little publicity. The atheist's takeover of the Royal Society (that was started by Puritans) by ridiculing any mention of God. The conspiracy behind evolution that was part of a much larger political revolution. Christian compromises with evolution examined. The disastrous laws against family life by the Bolsheviks after the Russian revolution that had to be rescinded. Are creation and evolution truly scientific? Did Britain have a special place in God's plans? FOREWORD OF THE FIRST EDITION BY HENRY M. MORRIS - "Malcolm Bowden has placed the whole subject in a new perspective..a book that can make a vital contribution..I am pleased and honoured to commend it to the thoughtful study of readers everywhere. Darwin's "Origin of Species" was used by those wishing to overthrow the Bible. CHARLES LYELL - THE MAN BEHIND THE SCENE. His "Principles of Geology" was a deliberately written false "science" to overthrow "The Mosaic account" i.e. the Genesis account in the Bible. THE "BEAGLE" VOYAGE Darwin was a creationist thoughout the Beagle voyage. THE X-CLUB - This was a small group of only 9 people holding all the important positions in the British scientific "establishment" who conspired to force the theory upon the nation. They ensured that only evolution would be taught in our universities. Examples of the present-day barriers facing creationists for promotion etc. THE SO-CALLED "SELL-OUT" OF THE FIRST EDITION OF DARWIN'S "ORIGIN OF SPECIES" This was only the normal pre-publication booking by agents. THE HUXLEY-WILBEFORCE DEBATE AT OXFORD - This was far from being a victory for evolutionists. Huxley did not really challenge Wilberforce with his "monkey" jibe. The powerful propaganda machine run by evolutionists has claimed this defeat as a "victory" and "turning point" for their campaign. THE LINKS BETWEEN EVOLUTIONISTS AND REVOLUTIONISTS - The Lunar Society consisted of a mixture of rising businessmen involved in the mechanical inventions behind the Industrial Revolution, evolutionists and those who supported the French Revolution. 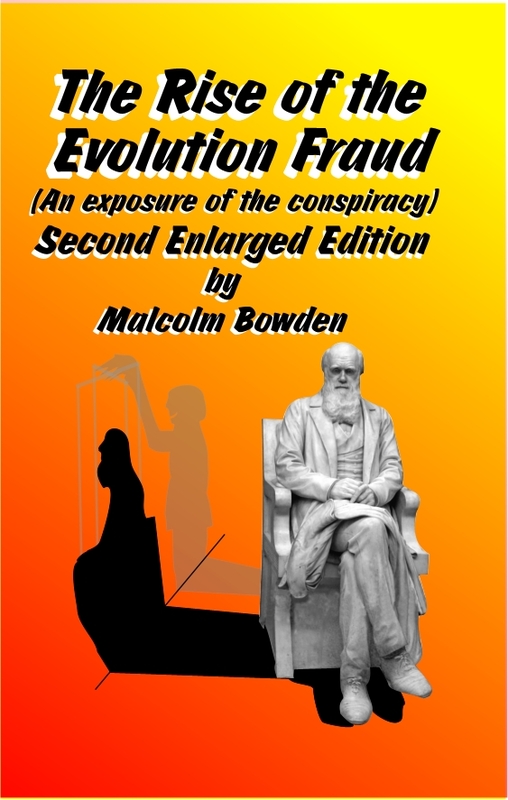 Several links between well know evolutionists and revolutionists are traced. THE MORAL IMPLICATIONS - The repercussion of the acceptance of the theory of evolution are demonstrated in living conditions and the quality of life of those anti-Christian nations that have adopted the theory uncritically. It is a rare moment indeed when such a penetrating and powerful book as this appears in print. I remember getting a copy of the 1st edition back in the early '80s and having my eyes opened to what were sometimes distinctly unpleasant truths. Yet such a meticulously and thoroughly researched book as this could not be ignored. Its claims, and they are all well-documented, stand every test of investigation, which is much more than can be said for many of those eminent public figures, educationists, philosophers, and yes, even politicians, who are its subjects. Bowden brings before us a veritable rogues gallery of men who have shaped our modern world, social engineers every one of them who have pursued just one agenda, the building of a society without God. That such men have always desired a godless world is hardly a surprise. It is the natural bent of man. But what does surprise and unsettle us is to be told the lengths to which some of them have gone to bring about such a world. The frightening aspect of it all is the fact that they have rarely worked alone. Each of them has walked onto a stage which has been carefully prepared for their arrival, and as each of them exits the stage, it is to give place to others who are even better prepared and who know their part well. Bowden shows that this is still operating today. The author begins by introducing us very briefly to the pagan's ideas of origins entertained by the Greeks. Then an equally brief excursion through the philosophers of the Middle Ages who perpetuated and expanded these ideas, and then it's straight into the 18th-century world of Erasmus Darwin (Charles' grandfather). From there it's a tour of a rogues gallery that stretches right into the 21st century as this updated edition includes many new exposures of the ongoing conspiracy. Bowden doesn't just criticise or point a finger. He burrows, and he burrows deep, into published works, diaries and even secret correspondence which was never meant to see the light of day. Many who have been taught to admire the achievements of these men, will find their opinions of them severely deflated. But I do urge everyone to read this book. It gives little known but powerful ammunition for the forthcoming battle of Darwin's birthday celebrations in 2009. NEXT PAGE - "Science vs. evolution"